"K" Line's transport of LNG started in 1983 as first Japanese owner/operator of LNG carrier "Bishu Maru." Since then, "K" Line has participated in Badak II, Arun II, large-scale projects for transport of LNG from Indonesia to Japan, also in Qatargas project that has successfully transported LNG from Qatar to Japan. With LNG carriers dedicated to these projects operating with accident free voyages, "K" Line has demonstrated its commitment to safety and has earned the reputation as a highly reliable carrier. Based on our foothold in LNG projects involving Japanese buyers, "K" Line has participated in off-shore business starting with transport of LNG from the Middle East to Korea, followed by such large-scale projects as Petronet (Qatar to India), Snohvit (Norway to Spain/US), RasGas (Qatar to Europe), etc. Corresponding to recent rise in global demand, especially in Europe/US, "K" Line expanded its activities and established London and Houston offices where experts are exclusively working for LNG projects. Utilizing these networks plus offices in Tokyo and Dubai, "K" Line will step up and further strengthen its transport capabilities, flexibly and positively responding to increasing and diversified global LNG shipping demands.
" Value for our Next Century" that was newly introduced in 2015. 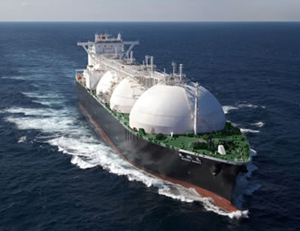 Select here for an article on the 'Bishu Maru,' our new LNG Carrier for Chubu Electric. Utilizing technology and experience from LNG activities and in cooperation with US based EnerSea Transport, "K" Line is focusing its efforts on developing the industry’s leading CNG (Compressed Natural Gas) carrier. Commercial efforts are now underway with clients who are evaluating worldwide gas development opportunities to realize the first CNG marine transportation project.